During a July 1999 test flight, the X-38 descends under its steerable parachute. 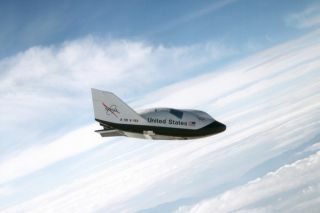 In this historical photo from the U.S. space agency, the X-38, a research vehicle built to help develop technology for an emergency Crew Return Vehicle (CRV), descends under its steerable parachute during a July 1999 test flight at the Dryden Flight Research Center, Edwards, California. It was the fourth free flight of the test vehicles in the X-38 program, and the second free flight test of Vehicle 132 or Ship 2. The goal of this flight was to release the vehicle from a higher altitude (31,500 feet) and to fly the vehicle longer (31 seconds) than any previous X-38 vehicle had yet flown. The project team also conducted aerodynamic verification maneuvers and checked improvements made to the drogue parachute. The X-38 Crew Return Vehicle (CRV) research project is designed to develop the technology for a prototype emergency crew return vehicle, or lifeboat, for the International Space Station. The project is also intended to develop a crew return vehicle design that could be modified for other uses, such as a joint U.S. and international human spacecraft that could be launched on the French Ariane-5 Booster. The X-38 project is using available technology and off-the- shelf equipment to significantly decrease development costs.